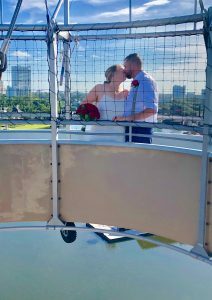 Ashley and Kiernan were married on the beautiful Aerophile Balloon at Walt Disney World’s Disney Springs in Orlando, Florida. Their intimate exchange of vows was captured by Steven Miller Photography as they took their love into the sky. Flowers by Lesley provided the beautiful accents and the custom ceremony was presented by Rev. Glynn Ferguson of Sensational Ceremonies. Congratulations to the lovely couple!